Charae Parks had been writing and rewriting her business plan for Chictore Boutique since 2015. With a degree in retail merchandising and fashion development and a full-time corporate job, Parks had gone through business accelerator programs and done extensive research to revise and refine the idea: an all-inclusive events venue. She had scouted a location, a Covington storefront with a patio that would be perfect for everything from baby showers to corporate events. She knew what kind of decorations she’d need and what food she’d provide. But Parks couldn’t find the money to make it happen. Investors weren’t willing to take a risk on an untried entrepreneur. Parks is 28, divorced and the mother of one child; she couldn’t risk taking on a personal loan. A Kiva loan — with a one-to-one match from LISC Greater Cincinnati — solved Parks’ dilemma. Chictore Boutique is set to open this fall. Fifty-one individual lenders through Kiva, plus LISC’s matching dollars, funded the business startup costs. Parks will repay the $3,000 loan over 24 months. Economic development is one aspect of LISC’s work helping communities throughout Greater Cincinnati grow stronger, more resilient and inclusive. Small businesses like Parks’ Chictore Boutique provide goods, services and jobs in neighborhoods, stabilize families, contribute to the tax base, and foster a sense of community, said Amber David, Small Business Specialist for LISC Greater Cincinnati.“It’s about building people and place,” David said. "It’s about building people and place." Amber David, Small Business Specialist for LISC Cincinnati. Founded in 2005 and based in San Francisco, Kiva is a nonprofit organization that allows people to crowdfund loans. To support small business development, LISC began a partnership with Kiva three years ago that allows local LISC offices to provide information and training about the platform, enlist local partners as trustees to vouch for borrowers, and match loans dollar-for-dollar. Over the last three years, LISC’s partnership with Kiva has resulted in more than 100 loans to businesses. LISC has invested more than $200,000 in matching funds. The underwriting and approval process doesn’t rely on a credit score. Immigration status doesn’t matter. Legal documentation isn’t a concern. What matters is a person’s business plan and her network of support. “It’s a very good tool directed at the business owners we’re trying to help,” said Karla Boldery, founder of the Latina Entrepreneur Academy. David provided more than 15 workshops about Kiva over the last year for local business support programs and accelerators, including the Latina Entrepreneur Academy. LISC also is building a network of trustees that can vouch for local entrepreneurs applying for Kiva loans. Ten trustees have been approved, including MORTAR Cincinnati, Price Hill Will, Walnut Hills Redevelopment Foundation, SCORE of Greater Cincinnati, LULAC Latina Entrepreneur Academy, and Aviatra Accelerators, which vouched for Chictore Boutique. Although women- and minority-owned businesses face particular financial challenges, any small business owner can struggle to get the money needed to start or expand — even and especially when she doesn’t need much. Banks can be reluctant to lend small amounts. Kiva loans run from $500 to $10,000. Borrowers repay Kiva loans, but with zero interest or fees. That’s the part that attracted Judy Sanderson, owner of Carrots From The Earth, a bakery that specializes in gourmet carrot cakes. 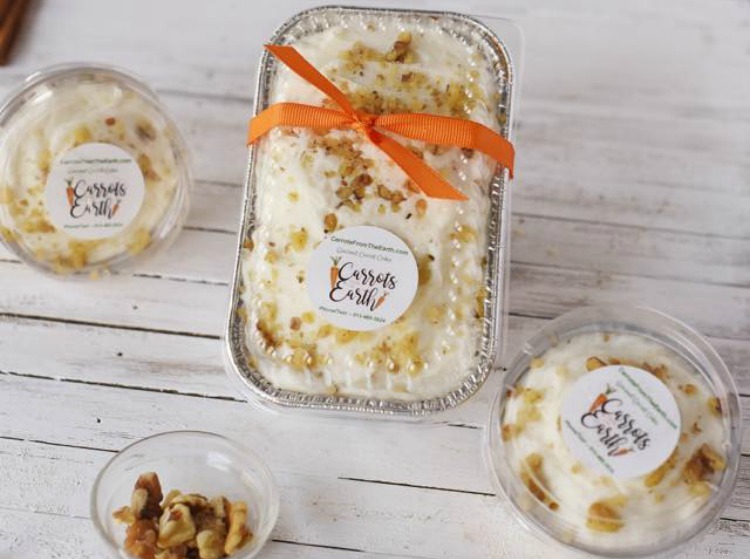 Judy's carrot cakes are also available in different portions.Sanderson needed capital because her baking business was booming. A childhood hobby that had become a part-time job had turned into a full-time business in 2017. Supplying carrot cakes to Jungle Jim’s and other retailers, including Kroger, meant a significant increase in hours at the commercial kitchen where Sanderson mixed up her recipes — and that meant a significant increase in costs. She went from using the kitchen about eight hours a month at a price of about $260 a month to needing the kitchen about 10 hours a week, racking up costs of about $1000 a month. Carrots From The Earth was one of the businesses to get a Kiva loan and the matching LISC funds in Cincinnati. While Sanderson uses her $10,000 loan to cover increased production costs, another half dozen organizations and entrepreneurs are working to borrow money through the Kiva platform. And Sanderson said she would recommend Kiva to other entrepreneurs. Contact LISC Small Business Specialist Amber David, adavid@lisc.org.